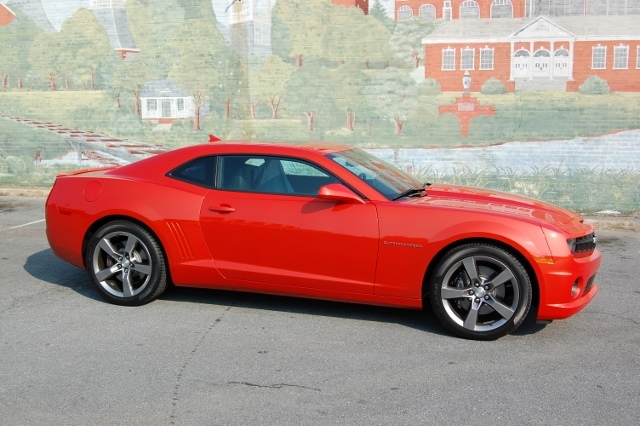 In this edition of Muscle Car Milestones, we’ll explore the 2010-2015 Chevrolet Camaro. Introduced as a concept at the 2006 North American International Auto Show, this Camaro features retro styling cues fused with modern technology. Its long hood, sculpted fenders, and rear tail lamps are reminiscent of the 1969 model, yet the engine and powertrain are packed with modern-day technology. For those that believed the Camaro died in 2002, this new iteration was welcomed by Camaro enthusiasts everywhere when it was unleashed in April 2009. Once again, this legendary nameplate was roaming the streets and cruising the highways. A lot happened in the muscle car world after the Camaro disappeared in late 2002. In 2005, the fifth generation Mustang gained fastback styling similar to the late 1960s era. Dodge also brought back the retro-inspired Challenger for 2008. Now that the Camaro was back, the pony car wars heated up once again. This time around, just like 40 years prior, three players were out there fighting for superiority. Practically every car magazine on the newsstand had an article featuring the new Camaro. Shootouts with the Mustang and Challenger were once again fodder for any magazine that wanted to pit these legends against one another. Chevrolet stayed true to the concept car when creating the new Camaro. The exterior boasts heritage-inspired design cues such as a V-shaped front end, gills in the rear quarter panels, and a sweeping roofline similar to the 1969 model. Our feature car comes decked out with Inferno Orange Metallic paint, sunroof, and a rear spoiler. 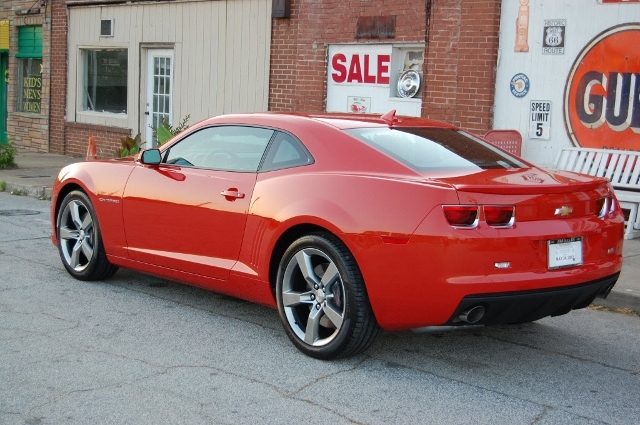 One of the features we like best about this Camaro car is the RS Package. This package includes 20-inch wheels with Midnight Silver finish, body-color roof ditch molding, and unique taillamps. We especially like the high-intensity discharge headlamps with halo rings that this package offers. In our opinion, the headlamps truly give this car a menacing guise and look really great when lit up at night. 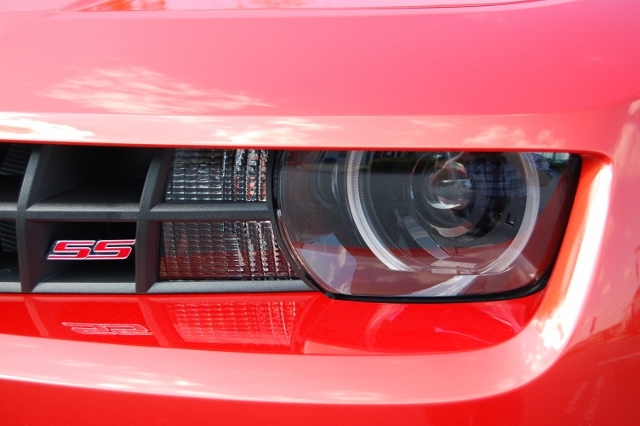 And what modern day muscle car is complete without details such as fog lamps, hood scoop and dual exhaust? 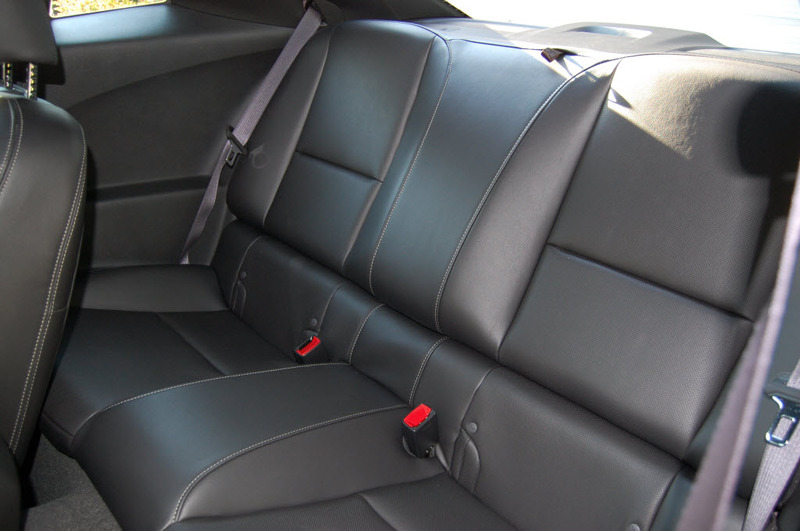 The interior of our Camaro also brings back memories of the 1969 model mixed with modern-day flair and technology. The instrument cluster’s speedometer and tachometer are mounted front and center just like those from the 1969 model. The retro theme carries over to the console which features a four-pack gauge cluster and a Hurst short throw shifter. Now we begin to see and appreciate all the modern-day amenities and technology that go into this all-new Camaro. 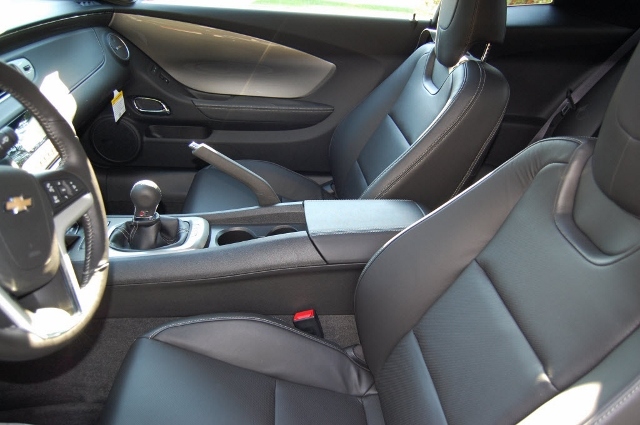 Our Camaro features Bluetooth hands-free calling, ultrasonic rear park assist, and steering wheel mounted audio controls. Forget about those old CDs you have lying around. You won’t need them. Just plug your iPod into the USB port and stream your music through the nine-speaker Boston Acoustics sound system. The interior truly comes to life during nighttime driving. Ambient lighting in the doors gives off a soft glow at dusk. Audio and AC controls also light up with a contrasting red luminescence. It should go without saying that driving the new Camaro is an adventure in itself. Climbing behind the wheel, we begin to realize what a sensory experience it is to drive. Turn the key and feel the car come to life. 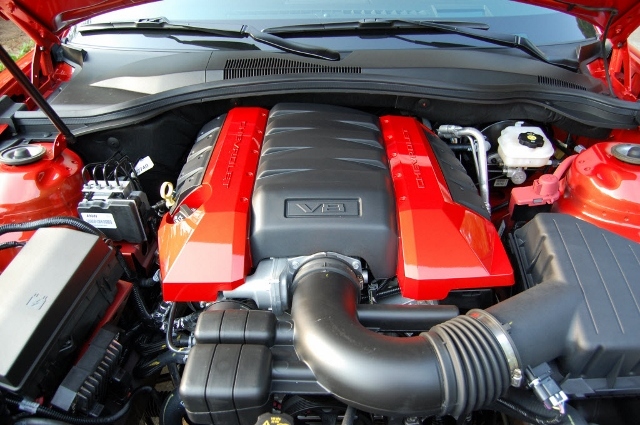 The engine slightly rocks the car from side to side as the 426 horsepower brute is awakened. Watch the gauges dance and come to life during startup. Close your eyes and listen to the rumble of the exhaust. The tone sounds like a ghost from the distant past. Remember those Camaros you drove many, many years ago? Yeah, it’s a little like that. Smell the rubber burn as you shift into first and press the accelerator. Hold on because it’s going to be a wild ride. A walk around this new Camaro reveals there’s no shortage of performance goodies on this SS. 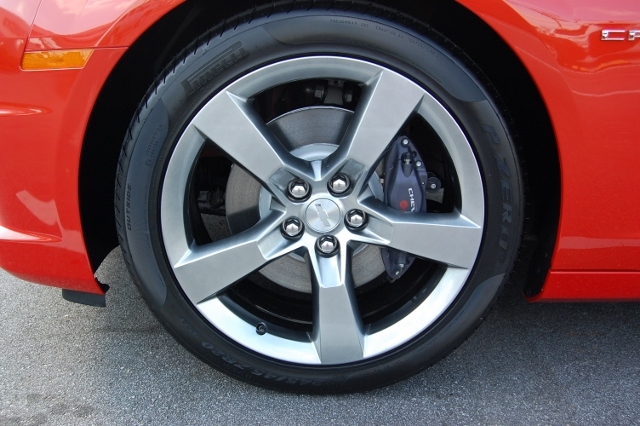 Pirelli PZero high performance tires are mounted on wide 20-inch aluminum wheels. Four-piston Brembo calipers and vented disc brakes have the power to bring the car to a standstill. Hear the engine rumble out back through the dual-outlet stainless steel exhaust with polished tips. Underneath it all, the FE4 suspension, with its tuned dampers and stabilizer bars, helps keep the driver in control in almost any road condition. Launch control also helps diminish wheel spin during takeoff when challenging Mustangs at the red light. We definitely enjoyed getting out and seeing what this Camaro could do. The car is crazy fast. Sprints from 0 to 60 in less than 5 seconds are a snap. 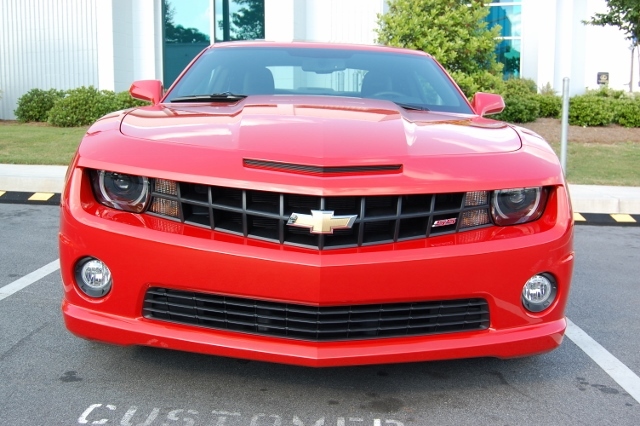 The SS can run the quarter mile in 13 seconds going nearly 111 mph. Plus, we think it’s one of the best handling cars we’ve ever driven. In the corners, the car sticks to the road like glue and rides well thanks to the 4.5-link independent rear suspension with progressive-rate coil springs. To test its road manners, we drove the car down one of our favorite backroads. 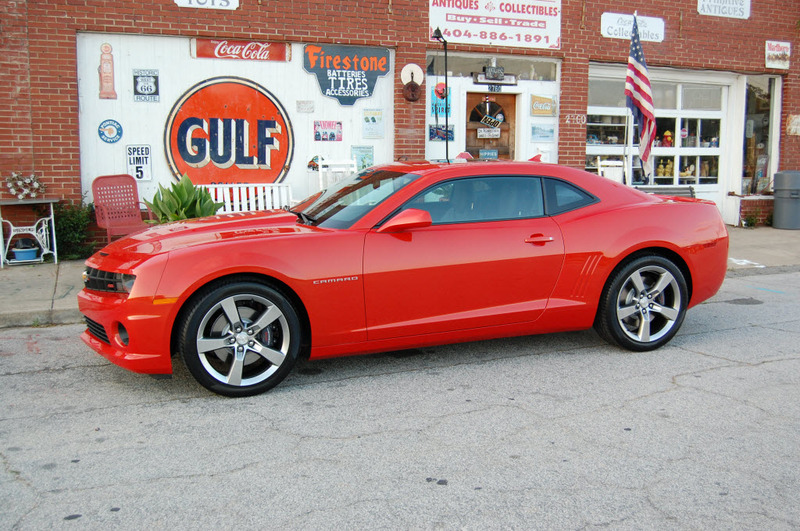 Highway 278 between Atlanta, Georgia and Gadsden, Alabama is the perfect place to see how well the Camaro performs. This highway features rolling hills, twisting curves, and great scenery along the way. Several small towns and communities with great restaurants and places to explore dot the landscape. On our journey, the four-wheel independent suspension keeps the car firmly planted in the hairpin curves near the state line. Climbing the hills feels effortless with 426 horsepower under the hood. Gas mileage was pretty impressive as well. On the open road, we got about 20 mpg and in combined city and highway driving, we averaged 15 to 17 mpg. Driving the new Camaro is an awesome experience. We’re glad Chevrolet decided to bring back this muscle car icon and give it another chance to thrill drivers once again. If you get a chance to try one out, you should definitely climb behind the wheel and take it for a spin.